CRESTWOOD, Ky. (June 2013) – After spending her whole life on a lake, La Grange, Ky., resident Laurie Venable knew she wanted some type of water feature in her landscaping. She also wanted to surround herself with nature on the one and a quarter acre size lot she and her husband, Jim, had just purchased. The property contained a house under construction and huge limestone rocks that had been excavated during the building process. Club’s Garden Tour in June. “These rocks became the basis of our waterfall and water garden,” said Venable, originally from northern Indiana. The couple, originally from Houston, have accomplished all of the landscaping. They have landscaped around the pond with hemlocks, rhododendrons, azaleas, hostas and astilbes. “It’s basically a shade perimeter,” said Venable. She spruces up the area in the summer with colorful annuals. The Venable’s garden will be included on this year’s Crestwood Civic Club Garden Tour & Luncheon. The tour will take place from 10 a.m. to 2:30 p.m. Friday, June 21. Luncheon seatings are 11 a.m. or 12:30 p.m. and will be held at the Crestwood Civic Club’s Clubhouse, 7215 Kavanaugh Rd. in Crestwood. Plants and garden items will be for sale at the clubhouse. 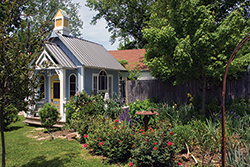 The Crestwood Civic Club Garden Tour & Luncheon usually includes three gardens, but this year a fourth location has been added. Creasey Mahan Nature Preserve, a 170-acre public charity, has been labeled “Oldham County’s hidden gem,” said Executive Director Tavia Cathcart Brown. The preserve had 31,000 visitors last year. 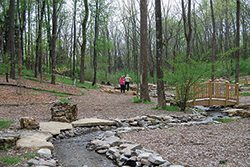 The Woodland Garden at Creasey Mahan has been added to the tour. The Woodland Garden is often a favorite destination spot for visitors. This garden features large beds with groupings of native wildflowers and ferns, a meandering stream, pond, peat bog, shaded benches and picnic tables, covering almost two acres. A new addition to the preserve is the Hendrik van Nagell Memorial Arboretum. This area showcases five different types of magnolias, dogwoods, maples, evergreens as well as a variety of other trees. Other vistas within the preserve include rolling hills, prairies, nine miles of trails, four year-round springs and picturesque views. Tours for this location begin at 9 a.m. and run until 2:30 p.m., with all other locations beginning at 10 a.m.
Additional gardens on the tour include those of Richard and Mary Lynn Morris of La Grange. Their home sits in the Russell Court Historic District of La Grange. When the couple moved into their home they sought the advice of Nature by Design and Land Shapes to make dramatic changes to their landscape. Rocks collected from around the United States accent the fence, which stretches from the street to the back of their property. Additional landscaping components include a water feature and various plantings the couple can enjoy from their back deck. Rebecca Maple also lives in the Russell Court Historic District and her home is the final stop on the garden tour. “When I purchased this house six years ago, I had a blank canvas for a backyard,” said Maple. She found it to be both exciting and intimidating. • Proceeds from the garden tour and luncheon go towards providing scholarships for local high school students. Tickets are $17 for the tour and luncheon, $12 for the tour only. Tickets for the Crestwood Civic Club 2013 Garden Tour & Luncheon can be purchased by calling Anne Murner at (502) 292-2701.